1. When you go to buy fireworks, you are naturally inclined to get those with names like Blue Palm, Morning Glories, or anything that ends in ‘Fountain’. 2. You are disappointed to find out that your local mulch store is closed for the day, like it is some kind of holiday. Bonus points if you thought ahead and got your mulch the day before. 3. Your family is waiting in the car for over ten minutes ready to go to the park, the beach, or the pool while you are watering “just one more plant”. 4. 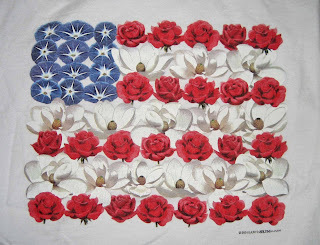 You wear your favorite patriotic shirt which features an American flag with flowers. Bonus points if someone else thought you were a geeky enough gardener to buy it for you. 5. You planted all red, white, and blue flowers in your front garden so it would look good for the holiday. 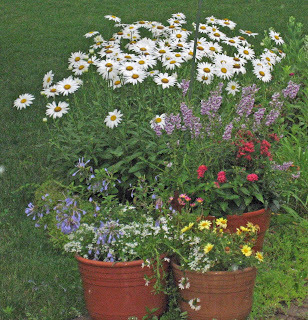 Bonus points if you moved containers around from other places to group your red, white, and blue flowers together for the day. 6. You try to convince your family that zucchini casserole, zucchini pie, grilled zucchini, marinated zucchini, and zucchini bread is a well-balanced meal for a 4th of July picnic, because you suddenly realized you may have planted too many hills of zucchini, again, and that’s all you are harvesting from the garden this early. 7. 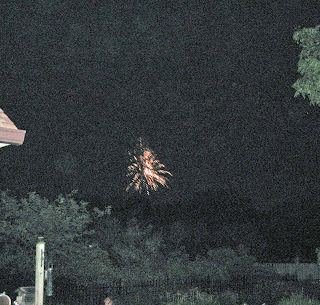 Your neighbors were shooting off fireworks on July 3rd and you tried to take a picture of them because you thought it would be nice to include a picture of fireworks on your garden blog post for the 4th of July. Bonus points if you took a good picture. 9. You wake up to find it is raining on the 4th and your biggest disappointment is that you have this day off in the summer and now you can’t do anything in the garden like you had planned. 10. You are in denial that it is already July 4th because you still have half a flat and several pots of spring-purchased plants that you haven't planted yet. 11. Your favorite patriot who signed the Declaration of Independence is Thomas Jefferson, because he had the best garden. Bonus points if you have visited Monticello. 12. You are grateful to live where having a vegetable garden of your own is for your own pleasure and not essential to ensuring you have food on your table year around. 13. You had enough time to include links to all the other Gardening Geek posts on your 4th of July Gardening Geek post because did I mention it is raining here at May Dreams Gardens? I'll stop at 13, in honor of the thirteen original colonies of these United States. God Bless America and have a safe and happy 4th of July! Fireworks over May Dreams Gardens. Someone has been shooting off these kinds of fireworks all week. Did I mention it is raining here at May Dreams Gardens? This is the best I could do for pictures of red, white and blue flowers. And because it is raining I even had time to find a classic rendition of "God Bless America" for you to enjoy. God Bless America and all the gardening geeks enjoying today in or out of their gardens! Oh Carol, you are a scream. That is a shirt in the first photo? Love it. Been to Monticello and love TJ despite his faults. So sorry it is raining there, but we do so need rain here, we would garden out in it. I posted about the food in our garden today, does that qualify me as a GG, BTW, that is the name the offspring's offspring call me, GG. Hope the nurseries in Knoxville are open today! Happy 4th to you. Happy July 4th from a Canadian! I suppose a garden geek would be pleased that the plants are getting a drink on this holiday. Enjoy the day. Great post, Carol. I wish I had that shirt to wear today. Even though it is raining at May Dreams, I hope you have a great Fourth. Very funny stuff. And once again I qualify! Are you surprised? From one GG to another, Happy 4th! Here's to all of us, in fact ... today we can celebrate the freedom to be a Garden Geek! Its raining here this morning too, but really that doesn't stop a garden geek does it? I was out this morning picking peas and yes zucchini along with other assorted items for a salad for a party later today. Then I ripped out some peas and got the bed ready for carrots and fall peas. So are you really going to let a little rain stop you? Ok I confess it was mostly just drizzle, not pouring down rain, or I wouldn't have been working the soil. A funny, but true post... so how many points does it take to qualify? Happy Independence Day! I don't know about the rest, but you know I have a love affair with Mr. Jefferson's garden writing. Japanese lesson for today: the Japanese word for fireworks is "fire flowers". hanabi (Don't know if this will show up correctly): 花火. The first character is hana, flower; the second character hi, fire (pronounced bi for euphony). This evening I'll be enjoying the fire flowers blossoming from my back yard as Austin's celebration is happening just a couple of blocks away at Auditorium Shores. Great post Carol. I agree with ChrisND, how many points does it take to qualify? :) Happy 4th of July. Cool T-shirt! Wish I had one to wear today. I am so guilty of number 10, sigh. You know you are a gardening geek if, when riding to the family reunion, you wish the driver would drive slower so you could get a better view of the flower gardens. Bonus points if you are the driver and stop the car to take a picture. Great post, Carol. Sorry it rained on you today. We had a beautiful day here in NNY. I got some gardening, but mostly spent it having fun. Guess I'm not too much of a gardening geek. I love that shirt. Happy 4th Carol! I did get to garden today...then watched city fireworks from the middle of the street...love the shirt! I so loved Number 10! I always feel that the 4th of July means it's too late to do anything new now. And I have a large coleus plant that was meant for a new patio pot. Didn't buy the pot yet so there it sits in the same container it came it from the store. It's been years since I've heard that rendition of "God Bless America". 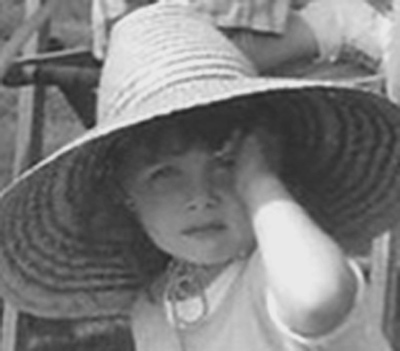 (the story is, that singer had never had music or voice lessons, just a natural ability). I like the flower flag t-shirt too! We didn't get that much rain here and the temperature was nice and cool. I did get a little weeding done. Happy Holiday Carol - your post was a hoot, I'm not nearly geeky enough, but I aspire to uber-goober-hood! I'll have to work on it for next year. The thing I relate to the most is the "watering one more plant"...since it is so unseasonably hot here. Seems like I just can't keep a watering can or a hose or a pitcher for birdbaths out of my hand! Happy rest of the gardening weekend! Yes, yes and yes...very amusing. Rainy here this weekend also but that is okay as all needs the moisture! Thanks for supplying that rendition of God Bless America. What a voice! Happy 4th. Maybe Kate Smith is a shirt-tail relative. The shirt is great, Carol. It does bug me a little that there aren't the proper number of stripes and stars, but then the flowers would have to printed really, really small. Or the shirt would have to be really, really big. I didn't get many points on this one, but in a past life our house was on a street used by people walking to the park for an annual fest followed by fireworks. I worked like mad each year to make our front garden as perfect as possible for them and enjoyed many horticultural conversations every July 4th. Great post, Carol. I see we selected the same song to celebrate the fourth. AWESOME list, Carol! I laughed like a lunatic. #6 and #7 were my favorites. Shucks, I'm not sure we even have squash flowers yet. We're still eating lettuce and peas. The only garden geek point is the one provided by Kathy in the comments, wishing the driver would slow down so I could see the gardens better. But I wasn't the driver. Happy 4th! Carol you crack me up. I'm such a gardening geek I haven't posted in my blog lately...and I have so much to show.